and replaces it with the cool outside air. The air in your home will be exchanged approximately every 5 minutes by 6 steel aerodynamic, individually balanced blades that are designed to remove the hot air quickly and quietly. When the outside air temperature cools down, open your home's windows and turn on your Whole House Fan. 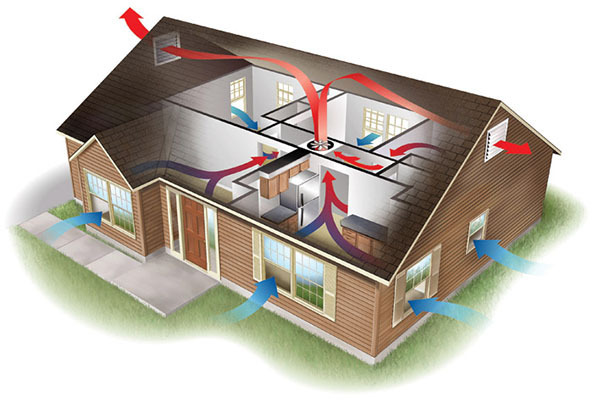 Cooler outdoor air then flows through the home - cooling the living space of your home. For example, in a 2,000 sq. ft. home, our Whole House Fan will do an entire air exchange in 4-5 minutes. That means you get results instantly!